We are enormously grateful for your support at our 10th annual breakfast on October 17, 2018. Salish Sea Expeditions welcomed Lauren Kickham, Director of Impact for Paul G. Allen Philanthropies, managing philanthropic initiatives that include Ocean Health, Conservation and Climate Change, as our keynote speaker. Ms. Kickham was joined by former KING5 Meteorologist Jeff Renner, and Dr. Charles Eriksen, Professor, University of Washington School of Oceanography. Dr. Eriksen is a physical oceanographer who delights in observing and trying to understand the deep ocean using long range underwater autonomous Seagliders developed by his research group. Their discussion focused on exploration, problem-solving, and innovation in the marine environment. Our emcee this year was Captain of the 2018 Race to Alaska’s winning team, Sail Like a Girl, Jeanne Goussev (click here for her bio and an article about Sail Like a Girl). Ms. Goussev is Managing Director of Fiduciary Services for Laird Norton Wealth Management and mother of a Salish alum. Over breakfast we learned about new technologies that are being used in marine exploration and what kinds of skills are critical for this next generation of doers and thinkers. 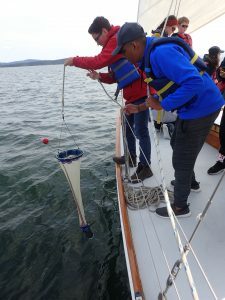 The event was a great opportunity to learn more about Salish Sea Expeditions’ mission to connect students with the Salish Sea, inspiring curiosity, critical thinking and confidence. Attendees were invited to make a contribution in support of “hands on deck, hands-on learning.” If you were you unable to attend, but still wish to support science exploration: Donate Now.